Among the telecommunication service providers in Nepal, Smartcell is also one of the prominent names that are heard in the market. The Smartcell telecommunication services/ Smart Telecom Private Limited (STPL) was established in July 1st 2008. Currently, it has subscribers around 1.3 million. With this large subscriber base, it has been able to become one of the fastest growing mobile operators in Nepal. The telecommunication services are provided over VSAT (Very Small Aperture Terminal) and other available technologies.� A GSM (Global System for Mobile Communication) service was commenced since July 2010 in Nepal by Smartcell Nepal. 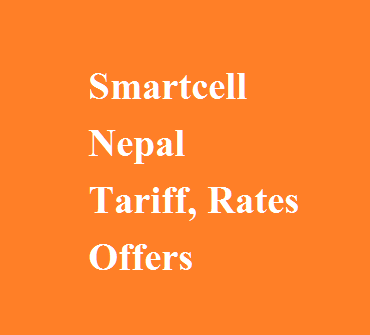 Smartcell or smart telecom with the saying �Your world, Our connection� has its coverage spread over in 4 out of 5 developmental regions of Nepal. Smart Telecom is present in 34 out of 75 districts in Nepal. Smartcell was able to obtain its USL (Unified Service License) in 2013 and since then it has been providing reliable and affordable services to the customers. Smartcell Nepal has been going on a full-fledged mission so that the coverage of its network spreads all over Nepal in 75 districts. For this purpose of extension of its services, Smartcell Nepal has been increasing the number of network towers. Also, it has been engaged in the fixture of necessary technological equipments and operation of the manpower. With Smartcell network, you can enjoy the prepaid services, voice and SMS services, internet packages and international calls at exciting prices. The rates for different services like calls, SMS and data is different at different times. The rates are different for the normal hour (from 6 am to 10 pm) and happy hour (from 10 pm to 6 am). The rates are cheaper in the happy hour period. Smart cell also introduced the sath-sath scheme inn 2016 June. With this scheme, you can get 2 sim cards at only Rs. 99 and the call rate between these 2 sath-sath sims is only Rs. 0.25. To get started with the Smart cell services, you have to fill up the customer application form as requested. You can get this in our nearest point of sales from the place that is accessible to you. You will have to bring along with you one passport size photo and original and copy of your identification document. It is for the verification purpose and you can bring your citizenship card, driving license or your passport. You can also enjoy the internet services in the smartcell network. The data rate without tax is Rs. 2 per Mb in normal hour and Rs. 1 per Mb in the happy hour. You can also enjoy international calls at different prices. You can get its information at http://www.smarttel.com.np/intl-rates. Smartcell has come up with a new scheme in this New Year 2074. The scheme is Talk unlimited 2074 and as the name suggests, you can Get Unlimited Voice and SMS for 15 days within smart network on Rs 100 New Utsav Unlimited Recharge. It also includes the main balance of Rs. 25. This special offer provided is really special.� Thus, with the connection of Smartcell in your world, make is more connected and special.